Most people would not dispute that inner peace is a prerequisite for world peace. Within each of us is a natural response for healing and maintaining homeostasis. Likewise, ecological systems in nature tend to seek balance and optimal health. When humans create a strong resonance with their internal well-being, is it possible that the greater environment around us is also impacted in a positive way? 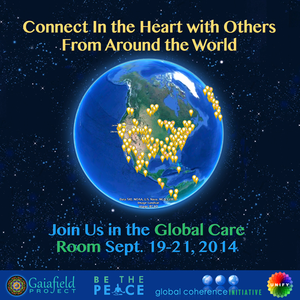 In collaboration with The Global Coherence Initiative, The Gaifield Project and BeThePeace have designed a Global Care Room to celebrate The International Day of Peace the weekend of Sept 19-21. The Global Coherence Initiative is a science-based, co-creative project to unite people in heart-focused care and intention, to facilitate the shift in global consciousness from instability and discord to balance, cooperation and enduring peace. This project has been launched by the Institute of HeartMath, a nonprofit 501(c)(3), a recognized global leader in researching emotional physiology, heart-brain interactions and the physiology of optimal health and performance. The Global Coherence Initiative is designed to help individuals and groups work together, synchronistically and strategically to increase the impact of their efforts to create positive global change. The Gaiafield Project develops "subtle activism" practices, theories, and programs and works with like-minded groups to co-create local, national, and global networks of subtle activists to support a shift to a planetary culture of peace. Unify was born out of a collaboration with BeThePeace in 2012, and has been pioneering globally synchronized meditations ever since. All of these wonderful people and organizations are creating a heart-centered resonance that is beginning to ripple around the whole world. The Unify Peacemap, another inspiring piece of technology for world peace, is currently listing almost 1,000 peace-related events all over the planet on September 21, the International day of Peace. 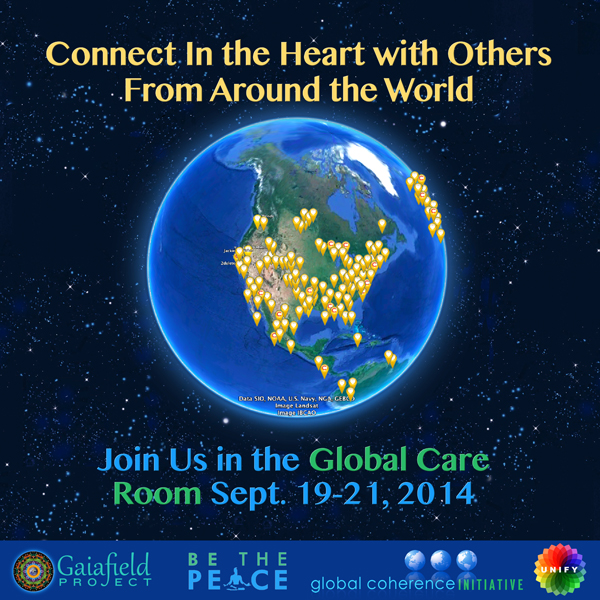 With this much energy and activity converging on Peace Day, it appears that the Global Care Room may be lighting up the world with healing vibrations of love. Take a look at the short video below to learn more. Check out the globally synchronized meditation event page on Facebook and be sure to tell your friends. Together our inspiration is contagious and perhaps our shared love for this planet can indeed bring the healing that is so needed at this special time in history!